Last month a Google executive confirmed the fact that the Google Home smart speaker would arrive in the UK too, following the initial launch in the US. The time frame given at that point was "this summer". The good news is that the Home will land in the UK earlier than that. 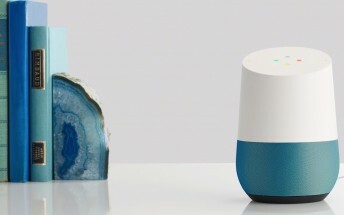 Today Google officially announced that its smart speaker will become available in the UK on April 6 for £129. You'll be able to purchase one from the Google Store, Argos, Dixons, John Lewis, and Maplin. At some later point it will also be sold by EE. The colored bases will retail for £18 if you choose fabric, and £36 for the metal ones, and it seems like these will be exclusive to the Google Store. That's not all, though. The Google Wifi mesh router system is also arriving in the UK on April 6. A single unit will cost £129, while a two-pack bundle will go for £229. The Wifi will be offered by the Google Store, Dixons, Argos, Maplin, and John Lewis. Later on it will be sold by Amazon too.